What would you say if you could share one thing with the world? 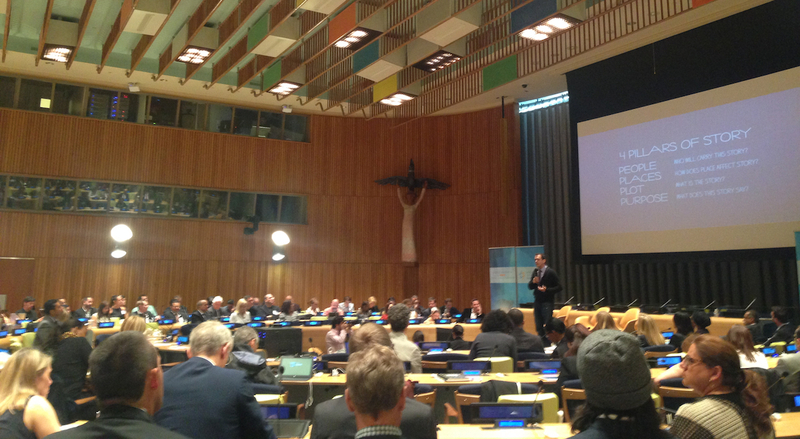 We had the amazing opportunity to speak at the Social Innovation Summit hosted at the United Nations in New York. I had 10 minutes to talk to an amazing group of people, but what did I want to say? In ten minutes you really want to get to one big idea. So what was it? Our one big idea that we wanted to share with people. I knew that if I tried to say too much I’d end up saying nothing at all. One big idea to give to a room full of people: CEOs or heads of social corporate responsibility for companies like JetBlue, Chobani, Google, and Microsoft and a few hundred more. As we thought about what we wanted to share, we realized that there is one storytelling secret that we think everyone should know. Heidi McKye and I put our heads together to co-author what exactly we might say on behalf of Stillmotion. This is what we came up with. Our one thing, as shared with everybody at the Summit. I am utterly obsessed with human behavior. With what makes us tick, makes us feel, what makes us move. There is this universal art form, a universal structure, that is incredibly effective at shaping our behavior; story. Story is in the fabric of everything around us. It’s how we connect with each other and it’s how we connect to the universe. We tell our children stories to help shape and guide them to lead the lives, that we wish for them. When we find a friend in despair, we bring them a hopeful story. And when invited to speak in front of hundreds of colleagues today, it is a story that I bring to all of you. By trade I’m a filmmaker. I’m a co-founder of Stillmotion out of Portland, OR. We’ve been incredibly fortunate to tell stories for companies like the NFL, AT&T, and CBS. Through all of these journeys, the one thing that always sticks with me are the stories of the people we’ve met. Stories like that of 74 year-old Danny Webber who had pancreatic cancer. Danny was a life-long Colts fan but never had the means to see a game in person. One day he shared his dying wish with his nurse – he want to see a Colts game live at the stadium. Those words resonated throughout the community and when the Colts heard, they sent him tickets to the next game. We got to follow Danny to that game. He was brought in in a wheelchair with his oxygen tank strapped to the back. As the team ran out into the field and the game began, Danny’s eyes filled with tears and he stood for the first time in months to share a standing ovation with his life-long love, the Colts. Those moments, those stories…they never leave you. Now you may not be connected to pancreatic cancer, or to football, but I do believe that everybody here (and everybody reading this) has something they care deeply about. That thing that sets them on fire. Here’s the problem. It’s not enough to have a great idea, product, cause, or organization – there is just too much noise out there. To cut through that noise, to really have people connect to what your doing, that is what a story can do for you. We believe that a well told story can truly change the world. But it does need to be just that ‘well told’, not just any story will do. Speak to the heart to move the mind. We need to make them feel before we ask them to do. Emotions evolved as a way of quickly summarizing our experience, what’s around us, and without needing to think about it, help guide our actions. As it turns out, without our emotions choice can be incredibly difficult. This seems counter intuitive. That analysis not emotion should guide choice. But recently we’ve discovered, that’s just incorrect. I heard a story on NPR a few years ago, a story about a man who had a brain tumor removed. The removal of the tumor was life saving but as a side effect, all connection to his emotions was severed. Simple things such as signing his name would take 30 minutes just to decide whether to use a blue or black pen. Emotions are a vital part of our choices and our behavior. We need stories to connect. To feel. But how do we tell stories that connect with people and make them feel? To start exploring that, we need to look at what makes up a story. There are four P’s, four facets, to story; people, places, plot, and purpose. People are the characters in our story. Place grounds a story in reality, it’s where the story lives. Plot is beginning, middle, end, the conflict and the journey. And purpose is why we are telling the story, what we want it’s impact to be. The P that we lead with, that we prioritize and hold above all others, will fundamentally change the story we tell. Lead with plot and you have an action story (or film). Lead with places and you have a travel show. Lead with purpose, which is what most of us do, and we end up with a commercial. There is an amazing opportunity to lead with People. Put people first. As people, we connect with people. People give us the incredible ability to create empathy, to connect, and to make our audience feel. Last year we heard the story of a 9-year-old girl using lemonade to fight child slavery. We drove down to meet her in person, thinking we could use our talents as filmmakers to amplify her voice. When we met her, we realized this was so much more. With that, we embarked on a journey across the world to make a film that would explore slavery. Now, I’m not sure if you’ve ever tried this, but slavery is not so easy to talk about. Bring it up at the dinner table and just see what happens. We certainly could have made a movie that led with purpose. One in which we interviewed all of the experts and explained the what, when, where, why, and how of slavery. But here’s the problem – not a whole lot of people would want to watch that movie, not unless they were really interested in global issues or a topic like slavery. That’s the challenge in leading with purpose, it will most connect only with those that share that same purpose. Instead, we led with people. We told the story of one 9-year-old girl (Vivienne). By leading with people, we get the audience to fall in love with Vivienne. We then show you what she desires, what she wants – to free 500 children using lemonade. Regardless of whether your connected to slavery, if we’ve connected you to Vivienne, you’ll go on that journey to see if she can reach her goal. And along the way we’ll educate you about the what, when, where, why, and how of slavery. If we do it right, you might just leave feeling inspired and empowered to get involved and do something. I want to finish with a short story that really brings this all together. We screened #standwithme in 30 cities across North America. In Wilmington, Ohio, as the credits started to roll, we came up on stage and opened up the floor for any questions the audience had. In the front row a small hand shot up. It was an incredibly touching and powerful moment. Had we made a movie on slavery, there was no way that her parents were taking her to the theatre that day. Now, had she been wandering down the street and just happened to stroll into the theatre while the film was starting, she may have lasted 5 minutes watching a film on slavery. And if she was strolling down the street, ends up in the theatre, and we strap her to a chair for the entire film, there is no way she stands up at the end and wants to rally all of the kids in her community. Instead, we made a story that led with people, a wonderful 9 year-old who made a stand. And on that day in Wilmington – her parents did take her. She stayed for the whole film. And she was inspired. She has even started to gather kids in her community to do something about slavery. That is the power of a well told story. While I was the one that stood there and spoke that day, the ideas in the talk are one of the things Stillmotion does best; a collaboration. Marshall, who got us an introduction to the Summit. David, who helped craft a much stronger hook and overall focus. Heidi, who co-authored the talk and what we teach about story, hashing out ideas with me long after she should have gone home for the evening. Justin and Amina, who I’ve built Stillmotion with, and without whom our stories never would have evolved to the place we are now. We’ve explored story together for years. And Grant and Joyce (and the rest of the Stillmotion team) who buckled up for the entire ride that has been #standwithme. They speak to my heart on a daily basis, even when I don’t deserve it. And that has certainly moved me to be more than I ever thought I could be. At the end of the trailer, as I stood there on a stage at the United Nations building, the crowd rose to their feet for a standing ovation. That too, is a moment that will never leave me. One that I wish I could bottle and share with all of my wonderful friends in the studio and beyond. Since they couldn’t be there, it’s this story that I bring all of you instead. If you’re interested in learning more about our approach to making #standwithme, we’ve got an awesome offer for Story First Documentaries, an educational course about our process for doc-style videos. Thru June 10th 2014, if you purchase Story First Documentaries you will receive a $50.00 Stillmotionblog.com/shop credit. Story First Documentaries features 2 hours of educational video content along with a 180 page ebook about the Camera, Lens, Lighting, Audio, and Movement decisions we made producing #standwithme. The course also includes a guide on how you can best utilize our strategies for your next doc-style project. Click here if you’re interested in Story First Documentaries. Congratulations, to the story, and to those who hold on to human being. I’m proud of you all and proud to have been part of the first course. Carry on the good work. It will feed you forever. Call or email heidi@stillmotion.ca – we do offer Story Strategy and consultations. That may be a great fit for you – a one on one consultation to get tips on the story you are looking to bring to life. Thanks for checking it out Elliot. Heidi and I have been obsessing over this for a long time, and it’s great to finally share it. This was moving my friend. Stillmotion has become more to me than a simple blog, or a studio, or a group of wonderfully talented individuals. It’s a philosophy! “Speak to the heart to move the mind” should not only be the way we approach filmmaking, but how we approach life and our own personal pursuits to finding purpose. I don’t know maybe I’m getting a little to deep, but there’s something special about every clip I see and every blog I read or view that comes from Stillmotion. Thank you guys for all of the amazing work that you do! Keep the bar set high and keep making history! You can never get too deep for us – we love sharing and exploring these ideas. All of these are equally, if not more, applicable to everyday life. After all, that just may be the most important story that we ever tell. Congrats on the huge achievement and thank you for the inspiring words. You guys remain to be one of my biggest inspirations. Thank you! Thank you for taking the time to share. The best conversations are dialogues, not monologues – thanks for being a part of that dialogue. “Speak to the heart to move the mind.” It says so much in a direct concise way. I just wasn’t sure what until a few days ago… but more on that later. Thanks so much John. Excited to hear what you are up to. Thank you so much for sharing this with us. Great speech and it encourages me to do more of the same. Thank you and PLEASE keep up the great work!!! “Speak to the heart to move the mind.” That’s deep, powerful, and incredibly inspiring. I feel like my biggest weakness is proper storytelling and reading that simple phrase may, quite literally, have caused a “Eureka moment” for me. I’ve been following Stillmotion for 3 years now and I can’t express to you how incredibly thankful I am for your team’s generosity and openness to share what you’ve learned–it’s changed my life many times over. Congratulations Patrick… you deserve every bit of it and more. Tonight, for some reason, I decided to check back to this website to see how you and Amina are doing; it has been a while. What a pleasant surprise to see a completely changed website and what seems to be career path! When I was last connected, I knew you were getting into filming and documentaries, but I had no idea that you have ended up here. I am not surprised in the least and am so impressed and inspired by what you are doing. When I read your speech above, I got goosebumps and teary imagining how many families and people whose stories have been told by your team. Everyone deserves to have his or her story told, but having that story told by StillMotion, invaluable.